This cemetery is located on Jones Road, about nine miles south of Peyton. To reach it from Colorado Springs, go east on Woodmen Road and south on Meridian Road. Turn left at Falcon Highway and proceed east for three miles. Turn right at Curtis Road and left onto Jones Road. The single marker left in this cemetery is visible in the tall prairie grass on the south side of the road about 0.2 mile east of the intersection of Jones Road and Cathys Loop. It's between the road and a house with the address 16215 Jones Road. According to GPS-derived geolocation (accurate to within 10 meters), the marker's coordinates are latitude 38°53'46.2"N and longitude 104°31'26.7" W.
According to his obituary (Colorado Springs Gazette, weekly edition, February 8, 1899, page 3), the El Paso County pioneer named Jonathan B. 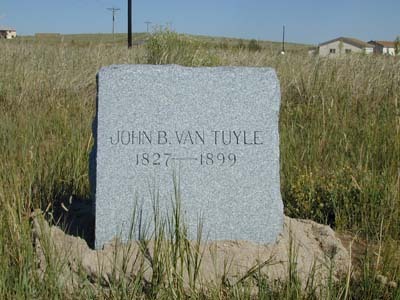 Van Tuyle died of "la grippe" (influenza) on February 1, 1899, at Surber, a community between Peyton and Ellicott.